I am pleased to announce you that the update is finished. Below you can find all changes. I proudly present you the new Logo for LinIICentury. This is a high-resolution Logo made in a very professional way. It was done by MrAve (https://mrave20.deviantart.com/). LinIICentury now has its own Updater / Game Launcher! Gone are the days where you need to modify host files manually. Gone are the days to put it server side files manually on your local computer. This new Updater / Game Launcher can do both. Detailed information will follow in our “How to connect” section. Here is a preview Image. 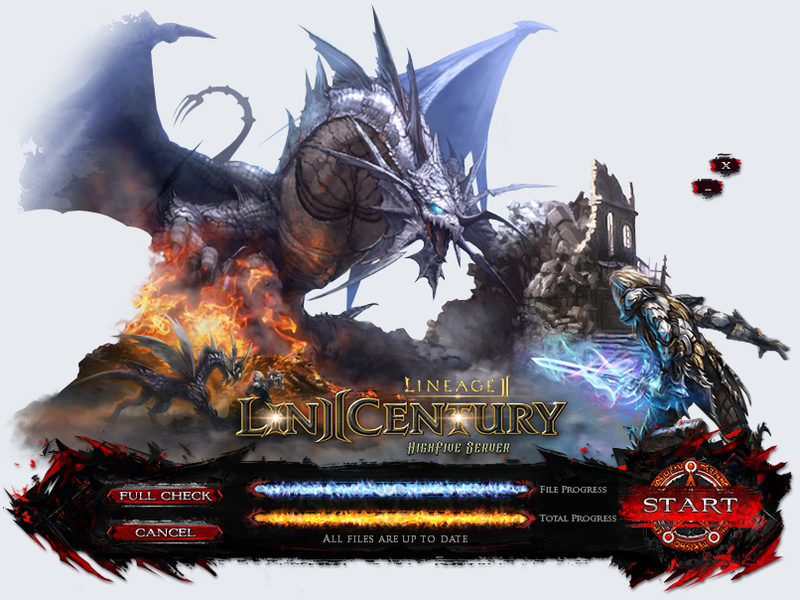 How to use the Updater / Launcher: If you have the game client already installed, just download the upater.exe from our homepage and put it in your Lineage 2 folder (main folder, not system folder!). If you don't have the game installed, just download the client, the updater.exe is already inside the folders. Requiem and Apocalypse can be worn by character of level 84. Specter, Helios and Shadow (Tauti) weapons from level 85 on. 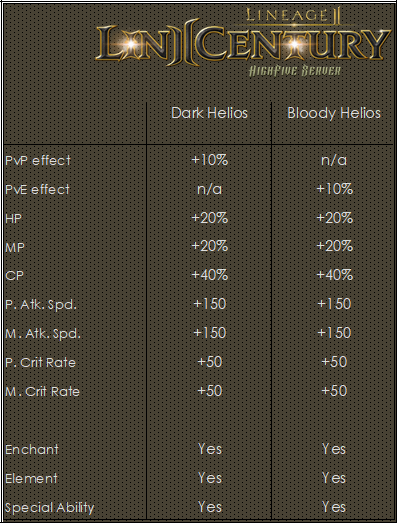 Helios weapons can be upgraded to either Dark or Bloody version. Dark Helios weapons grant the wielder a PvP power in fights while Bloody weapons grant a PvE power. The weapons can be upgraded with Dark and Bloody Enhancement stones. They can be gathered from all monsters within the Dragon Valley, Antharas Lair and Seed of Annihilation. Dark Helios weapons have a blue look while Bloody Helios weapons have their unique red/rusty effect. The physical and magical power of each weapon can be seen below here. Even with their passive skill, Dark and Bloody Helios weapons can have a special ability compared to the Shadow and Dragon weapons. Talk to Blacksmith Ishuma at the Gludio Airship field to add a special ability on your weapon. Talk to the Ancient Totem bestow either the Dark or Bloody effect to your Helios weapon. First, a new system of weapons is introduced by now. Starting with the Dark and Bloody Helios weapons which differ only by their PvP and PvE attribute but not by their P. Atk, M. Atk or their passive stats. 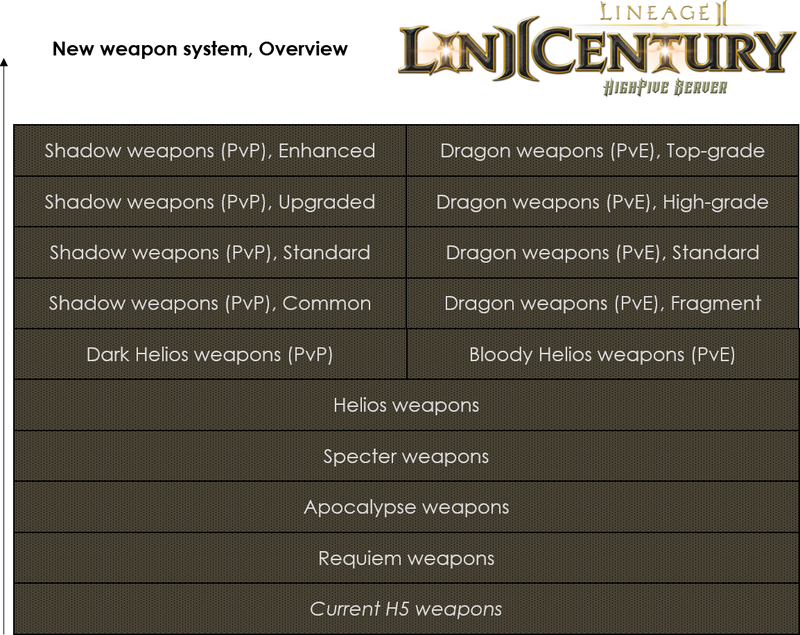 The same goes for the most superior weapons on LinIICentury, namely the Dragon Claw and Shadow weapons. You can either decide to walk on the PvP or the PvP path (or both). The biggest change here is the reduction of power of all Dragon Claw weapons. As they are just now, they are far too strong. For this reason, the P. Atk. And M. Atk. has been reduced by 40% and the other passive effects as well by a certain amount. The PvP bonus was removed on all Dragon weapons, however they now have a PvE bonus instead. The needed items to upgrade your Dragon weapons have been slightly changed. Moreover Rapier, Ancient Sword, Dual Swords and Dual Daggers are now available for all three kind of Dragon weapons. But before you complain, keep this in mind. Even after the reduction, these weapons remain still the strongest equally with the shadow weapons. For each weapon set a weapon box has been added. Every weapon box contains all weapons of that particular set and you have a chance to get 1 of them randomly. You can no longer use the known S-Grade enchant scrolls. However, new R-Grade scrolls have been added. Immortal and Twilight can be worn by characters of level 84. Seraph and Eternal armors from level 85 on. You can only gather Bound armor pieces. As its name says they are bound to the character and can therefore not be traded. They cannot be enchanted nor bestowed with an element. However, they can be upgraded to Standard armor pieces. Once you possess a standard armor piec you can first add a set bonus and later on if you wish to upgrade it to blessed version. Blessed armor pieces gives you another P. Def boost. Set armor bonus are always either “Attack Type” or “Defence Type”. 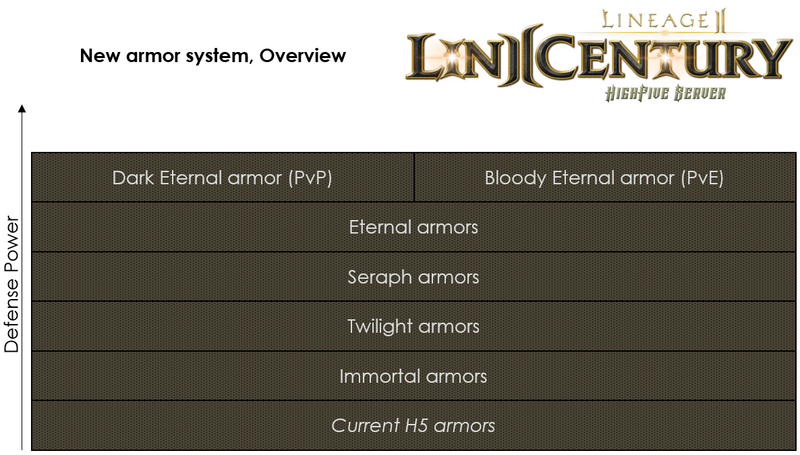 For eternal armor: There is a Dark (PvP) and Bloody (PvE) version. You will still benefit the set armor bonus as well as the PvP or PvE defence effect on top. 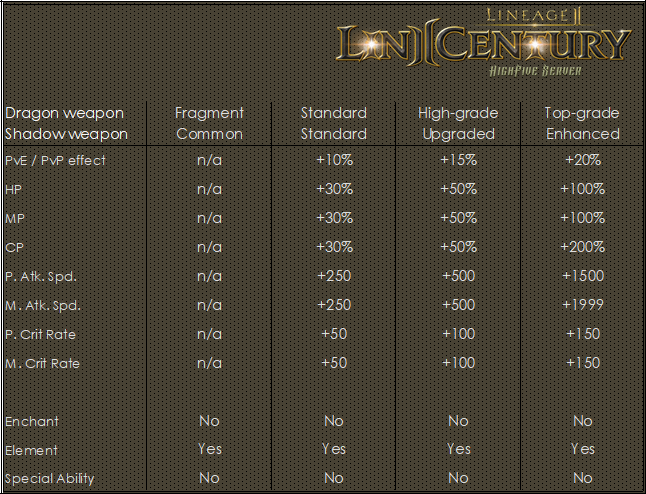 Note: The PvE effect does standardly NOT exist in the world of Lineage 2. This feature was EXCLUSIVELY programmed for LinIICentury. Moreover, these armors are of a top quality. Many graphic bugs were fixed for LinIICentury! As for the PvE and PvE Bonus, every single part gives you a certain amount of defense. Upper Body 8%, Lower Body 5%, Hand 2%, Feet 2% and Head 3%. I made the armor sets in a way that you can upgrade singles pieces from blessed armor pieces to bloody/dark pieces, get the PvE/PvP bonus as well as the set bonus. There is no need to wait until you can upgrade your whole armor set. But this goes obviously only for the eternal armor set. 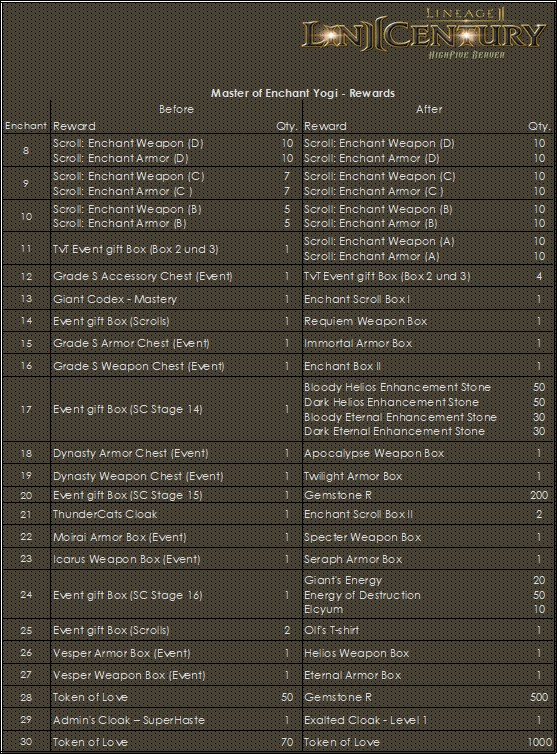 For each armor set an armor box has been added. Every armor box contains all armor pieces of that particular set and you have a chance to get 1 of them randomly. You can upgrade your Blessed armor. Therefore you need several items. You can now upgrade your Vesper Jewellery to Vorpal or Elegia Jewellery at the Ancient Statue NPC. 4 new jewellery sets have been added to the game. These jewels can be upgraded to Blessed Jewels at the Ancient Statue for Adena. 4 new shirt sets have been added to the game. Added 5 new word combinations for the letter event (Valakas, Lindvior, Hellbound, Helios and Earthwyrm) and their rewards were changed as well. Added new shots: Soulshot R-Grade and Blessed Spiritshot R-Grade. They are consumed by all new R-Gradde weapons. They cannot be used by S84 weapons or lower ones. S-Grade shots can no longer be used for the new weapons. Abolished the Teamspeak server since it was not used. 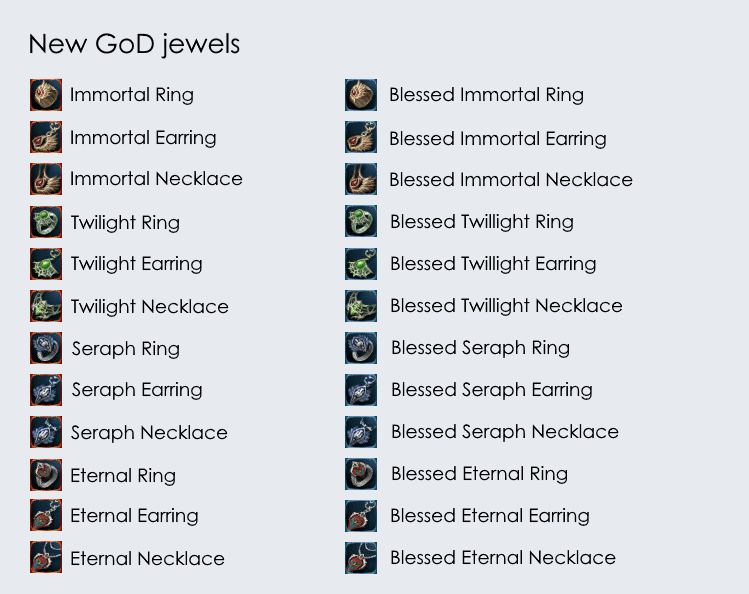 From now on every new Player has a total of six "LinIICentury 10-days limited epic jewelleries" in his inventory. As they are of no-grade you can wear them from the start. They grant the user the same stats as the original jewelleries. However, they cannot be enchanted or traded and last only for 10 days. The initial Adena you receive when creating a new character has been increased a bit. Baium's Level has been raised by two to Level 77. Added Red/Blue/Green Soulcrystals of level 15, 16, 17, 18 to Galladucci in Giran's Luxury Shop. Added two new levels (19, 20) of Red/Blue/Green Soulcrystals to Galladucci in Giran's Luxury Shop. They are needed for the Requiem, Twilight, Apocalypse and Helios weapons. Added a new "Enchant Scroll Box II" to LinIICentury. This box contains only the new R-Grade enchant scrolls. Renamed all custom NPC's. They now all share the title "Lin2Century". This indicates you that it is a custom NPC. The TvT Reward Box now shows the correct name and description. The Token of Love / Glittering Medal Box now shows the correct name and description. The Buff Potions Box now shows the correct name and description. 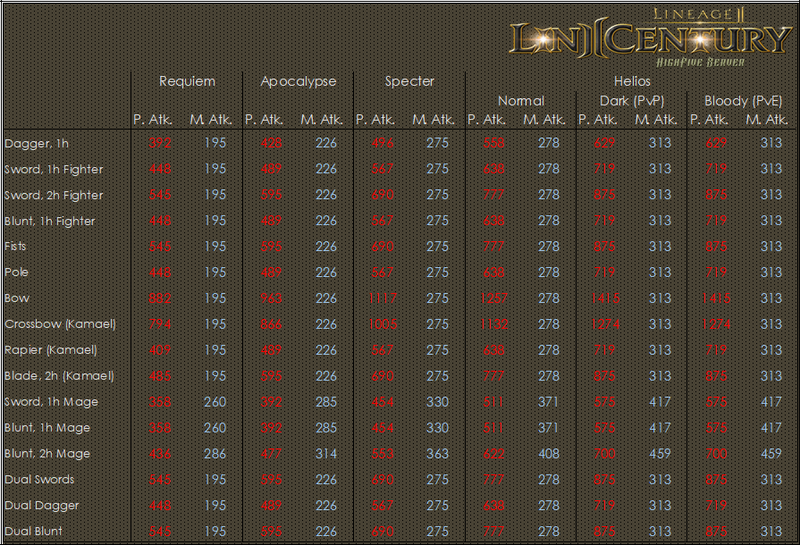 All Soul Crystals level 15 were removed from all Auction NPCs and weapon and armor boxes were added. Changed the rewards for Master Yogi. Many new items can be won now. The TvT event (Team vs. Team) does no longer take place every hour but every two hours. - The increase in XP for level 83, 84 and 85 has been reset to standard since it did not work properly. Maybe this feature will be relevant at a later time. This fact has been amended above. Furthermore: All player who currently hold a Dragon weapon will meet with me in game to exchange them for the new dragon weapons. The Atk. Power and Atk. Speed of all Insane Champions has been slightly reduced.